If you were waiting for Lenovo’s Phab 2 Pro, the first phone to include Google’s revolutionary augmented reality platform ‘Tango,’ you’ll just have to keep waiting. The official launch page, which once said “coming this summer” has since changed to “fall,” leaving augmented reality enthusiasts to shed virtual tears. 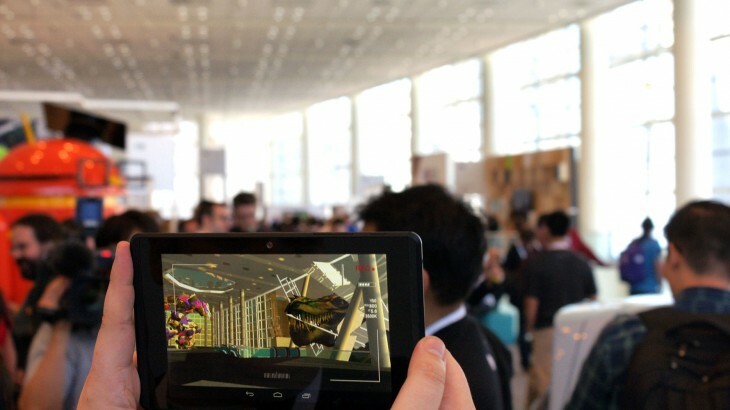 TNW reported the launch of the Project Tango/Lenovo partnership at CES and were in awe of the early beta. At Google I/O (part two), we saw another demo of just how far it had come. Both instances left us with the feeling that this was a legitimate game-changer in the AR space. Tango makes a mobile device spatially aware, enabling it to scan a room in seconds and determine the exact distance between items. It then renders a digital replica of the room that’s fully editable and augmentable from the handset. We used it to remodel a kitchen and play with scale dinosaurs at Google I/O, but the limitations of a platform like this are only that of human creativity. The plan was for Google’s AR tech to come bundled inside the Phab 2 Pro along with redecorating apps from Wayfair and Lowe’s. The monstrous mobile phone and its 6.4 inch screen seem ideal for Tango’s first foray into consumer mobile devices. The news is disappointing, but it doesn’t seem to be an indicator of Google’s waning interest — a la Project Ara. It seems Tango is all grown up now that Google dropped the “project” tag. Instead, the delay seems to be on Lenovo’s end, although we’ve been unable to confirm.